Ever wondered what happens when the healers need healing? On a daily basis, nurses deal with stressful situations that not only put a strain on their physical bodies but also to their psyche. Over time, this challenges the nurses’ ability to cope as well. World Health Organization (WHO) stated that a healthy job is “likely to be one where the pressures on employees are appropriate in relation to their abilities and resources, to the amount of control they have over their work, and to the support they receive from people who matter to them.” It is acknowledged by National Occupational Safety Association of America that nursing job is a stressful occupation. Consequently, several studies have been made to investigate the effects of occupational stress on their performance and personal lives extensively. 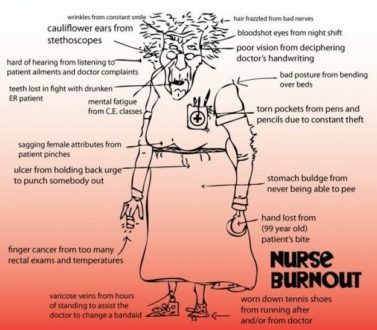 One major detrimental effect of burnout in nurses is increased occupational hazards in the hospitals. Wrong medications may be given. Assessments may be done haphazardly, and nurses may fail in detecting manifestations that may warrant immediate medical attention. Stress also affects the relationship between nurses and clients, with both parties not arriving at a favorable agreement about the plan of care. The Nursing profession is most focused on advancing the profession to take better care of clients. While this is good and is admirable of a profession, little efforts have been made concrete to address the welfare of nurses. In fact, according to WHO, only 15% of workers worldwide have access to occupational health services which include health and safety at work advising and first aid, among others. Being a nurse means subjecting one’s self to a constantly alarmed state. The mindset is always focused on the idea that at any second, the unit situation would go haywire. The job requires nurses to be skillful in handling emergencies in the least possible time. While unpredictable situations make the job exciting, the pressure in being able to take care of it right and safely is overwhelming. For an instance, a patient on a cardiac monitor suffered from premature ventricular contractions but was able to be resuscitated. The immediacy of the situation stresses the already drained nurse and affects the nurse even after the patient was stabilized. 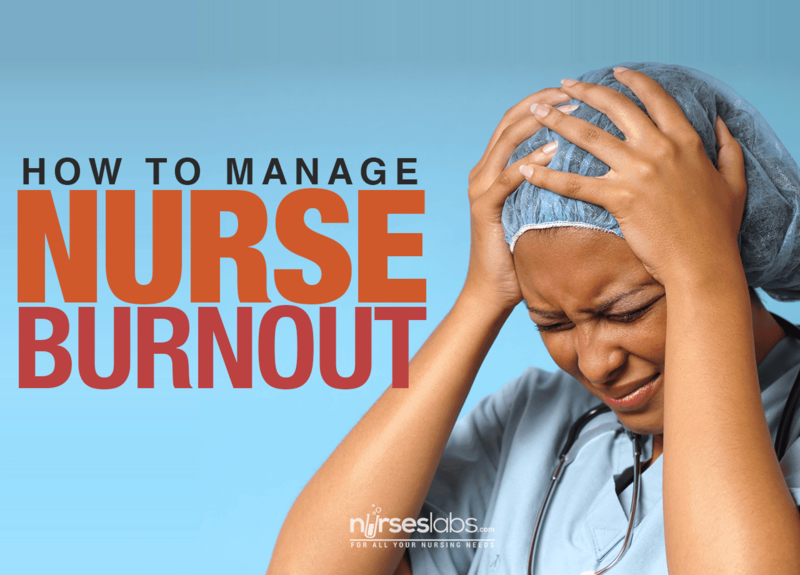 The cycle of nurse burnout. The thought of possible future attacks is unbearable, and nurses crane their necks and stand on their toes in anticipation they just wish they could press the code button for themselves. A private talk with the nursing supervisor may help to address colleague relationship conflicts. Feelings of inadequacy in clinical skills may be alleviated by buddy systems and informal teaching session with senior staff. Nurse burnout according to nurses. Acclimate a positive yet realistic attitude towards the nursing job. While it is vital to be positive about the situation, it is also equally important to be realistic about it. Of course, if you find it difficult to deal with the lack of supplies and equipment, this problem would need help that may be beyond the capacity of the institution. Coming up on a rotating schedule and rules on prioritization of usage among different units may make this less stressful. Don’t hesitate to air out what bothers you in the workplace. Your colleagues may feel the same way, and this is an excellent opportunity to discuss your feelings rather than have every part of the health care team suffer from unintended lashing out and passiveness. A quiet 10-minute break at the nurses’ station can provide wonders to the brain. Breathing exercises can also help calm down the raging soul. Ask among colleagues if they want to try yoga and swimming. After all, the exercise or relaxation regimen is most successful with a buddy! These unhealthy habits include smoking, alcohol, and even drugs. As you age, you may want to control your caffeine intake too. These substances may provide temporary distractions to chronic stress but over time, they will add up to your burden. A 5-minute call to your family is very unlikely to wreak havoc during your shift. Sometimes, all you just need is a reassuring voice of a loved one. A balanced diet will never go out of style, and this promotes overall good health condition. When you are at your best health, it’s very hard for stress to take over your body. Love yourself so much that you will always find time to add variety to the routines of your life. Commit to exploring yourself to new activities, so you always go to work exhilarated from a new hobby you just discovered. You may meet co-enthusiast along the way! Being a nurse is stressful, but when you come right down to it, the call of caring for other people is worth all the troubles. However, it would be a challenge to remember that when we’re about just to press the code button for ourselves. Therefore, nurses must take care of themselves too because when the time comes that the healers are the ones needing healing, the world will be down to a huge trouble that is before unthinkable.